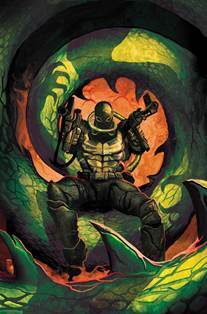 If you’re reading with no prior knowledge; Venom is a symbiotic alien suit currently paired with former Peter Parker bully turned War Hero Flash Thompson. It’s a great comic series and it’s ending soon thus my reason for this countdown of it’s top 7 Story Arcs . Beware Spoilers if you’d like to read these or haven’t read them yet! So without further delay the FINAL and BEST story arc of Venom: Volume 2! 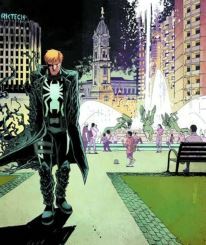 If there was one story you had to read involving Flash Thompson’s time as Venom it would be this one. All of the seeds Remender laid in the first seventeen issues come to an amazing climax in only four issues. The Savage Six is brought together by the Crime Master, a masterful tactician and huge organized crime boss. The Crime Master is a title of sorts passed down from different individuals throughout the generations. This Crime Master’s identity is one of the biggest surprises of the series so I won’t spoil it for anyone but I will say you need some real lengthy knowledge of Spider-Man’s history to guess it before he removes his mask. He hires the Human Fly (names pretty descriptive), Death Adder (member of the serpent society; looks like one too) and Megatak (a video game boss made real) to take down Venom. Crime Master also captures Eddie Brock due to a mistake Venom makes and he forcibly bonds Brock to the Toxin Symbiote. 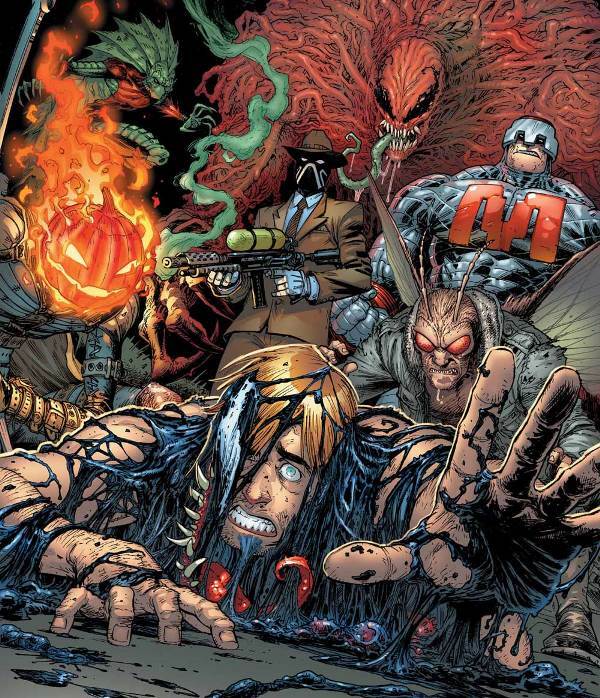 Venom’s nemesis Jack O’Lantern rounds out the Savage Six as Crime Master’s adopted son and right hand man. They set out to ruin Venom’s life in a flash, no pun intended. Crime Master figured out Venom’s secret identity early on in the series and used the information to blackmail Venom into working for him but when Venom finally fights back it gives Crime Master the excuse he needs to target all of Flash’s family. The four issues are a race against time as Flash Thompson must stop the Savage Six from killing those dearest to him and in true Flash fashion he does not succeed without the occasional mistake. That’s what makes Thompson as a hero so appealing. He really is profoundly human as he battles his alcoholism, thinks in terms of football, and occasionally messes up despite his best intentions. The fact that Venom defeats his villain’s but still losses his love interest forever as a result says what kind of tale Remender and Bunn put him through. The art though out the four issues is spectacular. Medina does a great job telling the story and all of the action is well defined on the page. 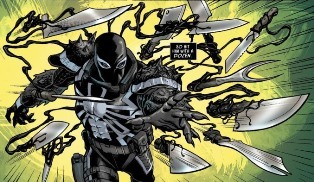 My personal favorite moment is when Venom flings a massive amount of knives at Death Addler. It’s a great moment when Venom looks beaten and comes up with a perfect Hail Mary. While on the subject of the art I cannot say enough for how vibrant and perfect the covers to the Savage Six are. Tony Moore and Edgar Delgado do the best cover of the run with issue 21 (pictured at the top of the article) but my personal favorite is Michael Del Mundo’s for issue 20 (pictured in the first paragraph). Following in that vein I think the best line of the story goes to Crime Master after his surrogate son Jack O’Lantern falls into a vat of acid while screaming, “Daddy Help Me”. He simply responds “He’s a tough kid, he’ll be fine”. It’s a twisted sick and hilarious moment in the story. Crime Master also has a fun bit of dialogue directly after his demise but no further spoilers will be found here. Although the actual Savage Six arc is only four issues it really feels like six as the story is set up in Venom 17 and closed out with Jack O’Lantern’s capture in issue 22. Remender pens a great close to his run on Venom with issue 22 finishing the issue with a quote from Ralph Waldo Emmerson, “Finish every day and be done with it. You have done what you could. Some blunders and absurdities no doubt crept in. Forget them as soon as you can. Tomorrow is a new day. You shall begin it serenely and with too high a spirit to be encumbered with your old nonsense”. I read this issue the day my Pap Pap passed away and the quote struck me so deeply I used it in his eulogy a few days later. So in its own way this series has been there for me like a friend in some dark moments and it’s really sad to see it go. With that in mind I’d just like to thank all of the creative people, writers to editors to inkers etc, who have been involved with it in its 42 issue run because they all helped to create a fantastic series that I will continue to read long after it’s conclusion. 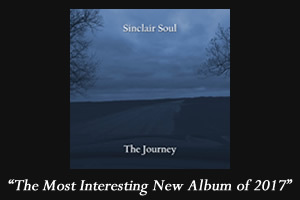 For those of you have read all of these thanks for the support! This countdown has been my way of coming to terms with the close of the series and the possible loss of Flash Thompson as Venom. Hopefully he does maintain it and stays an important character at Marvel but internet rumors and future comic previews paint a bleak picture. Although Rick Remender told me on twitter, “There is so much cool stuff coming up with the character, you’ll be stoked”. So maybe Flash’s future isn’t so dark after all! Only time will tell but it’s been a wild ride and I hope it continues.